The Vocation of Marriage in God's Plan | Cardinal J. Francis Stafford D.D. And Pharisees came up and in order to test him asked, "Is it lawful for a man to divorce his wife?" He answered them, "What did Moses command you?" They said, "Moses allowed a man to write a certificate of divorce, and to put her away." But Jesus said to them, "For your hardness of heart he wrote you this commandment. But from the beginning of creation, 'God made them male and female.' ‘For this reason a man shall leave his father and mother and be joined to his wife, and the two shall become one flesh.’ So they are no longer two but one flesh. What therefore God has joined together, let not man put asunder. "(Mk 10:2-9). The feast of Our Lady of the Rosary, which is ordinarily celebrated today, is superseded by the Sunday liturgy. The first reading is taken from the Book of Genesis, 2:18-24, "So the Lord God cast a deep sleep on the man, and while he was asleep, he took out one of his ribs and closed up its place with flesh. The Lord God then built up into a woman the rib that he had taken from the man. When he brought her to the man, the man said: 'This one, at last, is bone of my bones and flesh of my flesh; this one shall be called woman for out of her man this one has been taken.'" This reading has been chosen to show the origin of the Church's teaching on the indissolubility of marriage. The second reading is from St. Paul's Letter to the Hebrews, 2:9-11, "He who 'for a little while' was made 'lower than the angels', that by the grace of God he might taste death for everyone." Today's reading talks about Jesus' exaltation through abasement. The Gospel is from St. Mark, 10:2-16. On the "divorce" section of this Gospel see today's first reading. Christ clearly states that from the very beginning, God's plan for marriage was that it should be a life-long unity of one man and one woman. Its purpose is the procreation of children and their education, as well as the mutual love and fulfillment of the husband and wife. These demand this life-long bond. Divorce, which tries to break this bond, breaks the law of the Creator who decreed what was best for the temporal and spiritual welfare of the human race. 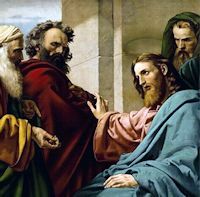 The last four verses of today's Gospel describe an incident which is in no way connected with the previous discussion but which has a very useful lesson for all Christians. It describes Christ's love for children and while manifesting this love he stresses the need for all his true followers to be childlike. "I say to you, whoever does not receive the kingdom of God like a child shall not enter it." To receive the kingdom of God is to accept the teaching of Christ and live according to it in his kingdom on earth. He who does this will enter, after death, into the eternal kingdom of heaven. Christ says, however, that we must accept "like a child": his kingdom on earth, his teaching and the Church he founded to carry on that teaching. It does not mean: in a childish way, an unthinking, uneducated way, but in a child-like way-a humble, grateful, receptive way. A child is unselfconscious, content to be dependent on others' care and generosity. Christianity is a gift of the generous God to us, we have done nothing and never could do anything to merit it. We must accept it simply and gratefully as a gift; we could never deserve it. While Christianity is a religion of reason and conforms in all its aspects to the rational nature of man—its basis is the revelation of God who is the author and foundation of all rationality—yet it is the heart of man rather than his intellect which Christ means to capture. The assent of the intellect to the doctrine revealed by Christ is not sufficient of itself for a Christian to earn the eternal kingdom; faith is the total acceptance and commitment of the believer to God through Jesus Christ. The man of true faith commits himself to God with a filial childlike trust, assured that if he does all that he can God will do the rest. Therefore, our Christian faith must be childlike, a trusting, humble and obedient faith. This is the kind of faith that will move mountains—the mountains that loom so large in the vision of too many Christians today—the mountains of doubt, selfishness, unwillingness to be subjected to authority. Christ asks us, if we would be his followers: to take up our daily cross and climb the way to Calvary after him. This daily cross is made of the troubles and trials of life from which no one can escape. They can be borne with reluctance and grumbling or they can be accepted as the loving God's means of training us for the future life. Every true Christian accepts his trials in the latter way, for if he is true to his faith he knows that his years on earth are his apprenticeship to prepare him for his eternal life. God is surely not asking too much of us when he asks us to live our Christian faith in childlike humility, candor and confidence during the days of our pilgrimage on this earth. "'Go thy way, thy son lives.' The man believed. . .As he was. . .going down, his servants met him and brought word saying that his son lived" (Gospel). The weakened condition of the ruler's son reminds us of our own world. It is worn out by the fever of passion. It is unable to help itself until faith in God returns. A humble confession of sin is the secret of obtaining God's mercy (Introit) and pardon (Prayer). Be filled with the Spirit during the psalms and hymns of Mass; be subject to one another in public life (Epistle). Liturgy and Catholic Action are twins! When the official's faith was rewarded, he immediately spread the faith in his whole household, his relatives and employees. Gratitude should prompt you also to be lay apostles, ever ready to "speak religion" in and outside your house.